Gout is a so called crystal arthritis, painful condition that develops in some people with chronic elevation of the uric acid levels. 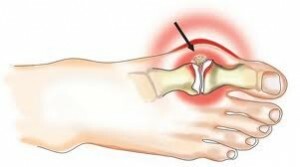 It can present as an arthritis as well as the deposition of the uric acid crystals in the soft tissues (tophus), kidney stones (approximately 15% of patients with the gout) or abnormal work of kidneys. When the arthritis is caused by the deposition of other type of crystals (calcium pyrophosphate), it is called a pseudogout. The most common age of the onset of the gout is 30 to 45 years of age in men and after the beginning of the menopause in women. Typical gout attacks presents as sudden onset (often over few hours) episodes of severe joint pain, redness, and swelling. Typically attacks last few days and subside although sometimes disease has a chronic course reminding rheumatoid arthritis. Arthritis may involve one or few joints and often starts in the big toe (called podagra). The arthritis develops as a result of intense inflammation when immune cells try to digest uric acid crystals. Immune cells release inflammatory chemicals that cause swelling, pain and redness. People with gout are at increased risk of developing kidney stones. The kidney stones composed of uric acid that are part of gout often contain calcium crystals as well. The best way to diagnose gout is to examine synovial fluid from an affected joint under a microscope to look for urate crystals. The sample can be obtained from the typhus as well. Sometimes, the synovial fluid analysis is not possible to obtain. The diagnosis is made then based on the typical clinical picture and presence of the high uric acid level in the blood samples. Rarely, patients have normal levels of uric acid during gout attacks. Management of acute gout attacks involves the use of medications to decrease the inflammation (NSAIDs, colchicine, and prednisone). When attack is resolved physicians use medications to decrease uric acid levels (allopurinol, uloric). They are continued indefinitely. Urate-lowering medications decrease uric acid levels in one of three ways: they increase uric acid elimination by the kidneys, they decrease production of urate, or they convert urate to the more readily excreted allantoin. Colchicine and occasionally, prednisone or NSAIDs are given during first few months of initiation of allopurinol and uloric to prevent acute attacks of gout. There are newly developed medications such as anakinra or pegloticase that are used in cases of severe refractory gout. If diet is accompanied by weight loss (often with increased exercise) improvements in gout control can be impressive. Diet may have additive benefits to medications. Diet therapy prevents type 2 diabetes and cardiovascular diseases that are more common in patients with gout.